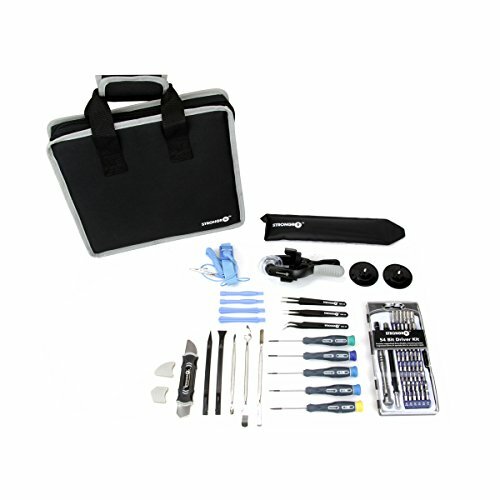 We asked numerous electronics repair technicians what their perfect tool kit for repairing mobile phones, tablets, laptops, game systems, and various small electronics would be, and based off their feedback we created this kit. The ergonomic soft touch design lets these tools be used all day without fatigue or cramping. This commercial grade set will easily endure everyday use. The technician preferred magnetized screwdrivers hold fasteners in place during assembly. Use the tweezers when the most precise repairs are demanded. Use the suction cup pliers and microwaveable adhesive softener to remove the toughest of screens. All 86 tools are packed in a durable heavy-duty nylon case with handle for easy transport while keeping tools organized and accessible.